A unique bakery on Vancouver Island is dishing out delicious pastries, with a side of confidence to boot. 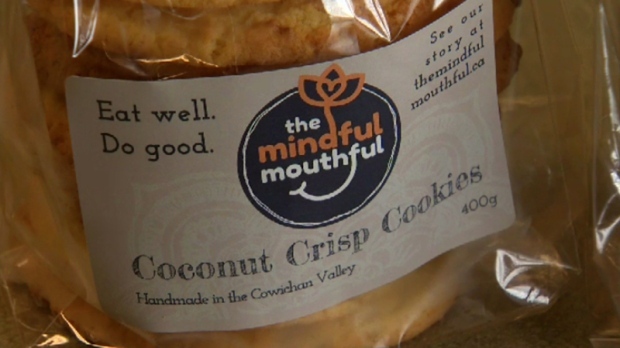 The Mindful Mouthful Bakery in Duncan, run by the non-profit Clements Centre Society, employs 20 cooks with developmental disabilities who bake tasty treats like cookies, squares and meat pies. Organizers say it’s an opportunity for the cooks to build their skills and self-esteem. “It’s a training kitchen for adults with developmentally disabilities to teach them life skills, cooking skills,” said Dominic Rockall of the Ed Clements Centre Society. But what’s unique about the kitchen, once run by volunteers, is that it’s now dishing out paycheques to the staff who work there. “Yes, we get paycheques and we bring them into our banks,” said baker Alyssa Harrison Cook. Rockall said the bakery’s goal is to be self-sustaining within three years. “At the moment, we have a wage subsidy from the Vancouver Foundation to make this possible,” he said. The kitchen has 20 cooks earning a little more than minimum wage and three full-time support staff. “It kind of teaches you how to make your own kind of cookies, and teaches you how to do your own ways,” said Cook. Not only is it a great cause, but staff say they’ve been told the bakery’s cookies are the best in the Cowichan Valley. Staff at the bakery have also designed labels for their products, which they hope to have on store shelves and in restaurants this spring. “As an added benefit, when they buy products from us with our name on it, they know that they’re supporting a great cause,” said Rockall. The bakery is located on Clements Street in Duncan and also offers a catering menu on its website.